The shirt front that roared. When Tony Abbott threatened to ‘shirt front’ Putin, he put a lot on the line. He told journalists that he was going to shirt front the Russian president on the sidelines of G20 summit over the tragedy of the Malaysian airliner crash in the Donetsk Region of Ukraine in July. What was he thinking? What did he hope to achieve? Who knows with Abbott? What is certain is that the gesture got him a lot of media interest. A bit of this was benign and non-intrusive. Some media types even looked up the term and explained thoughtfully on TV that it was an expression from Aussie Rules football. It was hopeful but did not really explain or excuse anything. The net effect, moreover, was to hang an albatross around Abbott’s neck. Perhaps the shirt front was calculated to appeal to the alpha male. Perhaps it did win Abbott a flicker of attention if not admiration from macho types who believe that assertiveness equals being ready with your fists. Ironically, however, the same types would be irrevocably alienated by the lack of action. You can’t make a threat you are not prepared to carry out. Whatever modest gain in attention, the challenge is likely to have cost him further credibility. And the rest of us have probably had enough machismo to last a lifetime. Or Abbott’s political lifetime. The shirtfront venue was first set for Brisbane at the G20 which Abbott is pretending to chair. Yet even Abbott subsequently realised that a shirt front was an unnecessary complication at a meeting which would require every ounce of his energy, just to appear to be in control. The distraction of an impending punch up out the back could be a tad distracting. Accordingly it was brought forward to APEC. (Entrepreneurs are probably hard at work as we speak creating an iPad shirtfront booking app for that.) And there Abbott would be happy to let the matter lie. But some matters will not just lie down and die. In the event, there was no shirt front. Tony toned it down almost immediately. By the next day he was telling reporters that he was absolutely determined to have a very robust conversation with the Russian president.” Instead, he appears to have had a quick private whinge to Putin. No doubt he got on to the Russian leader’s complicity in the death of innocents in the shooting down of MH17. No doubt also Putin could have raised Australia’s appalling human rights record on asylum seekers and its recent indictment by the UN committee on torture. It does not seem to have gone all that well. His promised great remonstration with the Russian leader is said to have lasted a whole fifteen minutes. He claims to have raised the issue of compensation by offering an indirect analogy. The US offered compensation when they accidentally shot down a passenger jet. 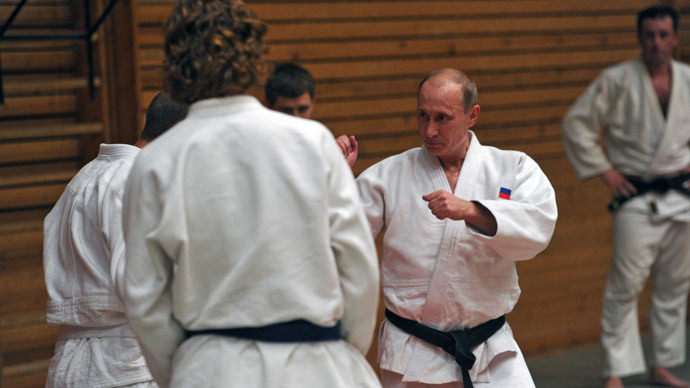 Putin’s response is not known but can safely be guessed at it. The shirt front was more than an embarrassing gaffe. It will haunt Abbott for some time to come. It has got him the sort of attention that he would rather have done without. Naff. Limited. Testosteronic. Not flattering. Not useful. But enduring. And it even attracted the attention of the Minister for Foreign Affairs. You know you are in trouble when Julie Bishop goes into bat for you. Putting, as usual, an impossible spin on it, Bishop claimed this week that the term has now entered the diplomatic vernacular. It’s not a gaffe but a nifty new term for a diplomatic confrontation. Abbott did not lose control after all. On the contrary we should all be grateful for his talent as a wordsmith. Quite the Shakespeare of the world stage. If you swallow that you are in deep trouble. Next you will be believing that Tony Abbott is capable of leading the G20 through the next meeting. Or that he has prepared for the task. Or that he has the capacity to follow the discussion, let alone make a useful contribution. What is more likely is that this lapse will prove a defining moment. When the world leaders look up at him at the podium on 16 November in Brisbane, it is likely to be through the lens of the shirtfront. They will wonder how a man who has trouble being in charge of his lip could ever be in charge of anything bigger, even if the chairmanship of the G20 will last only a year. They will not be happy with his almost complete lack of preparation; his ideological bent towards letting the market sort things out for itself when many of them have put in the hard yards intervening to prevent financial meltdown. They will see a man with anger management issues, a man who has trouble keeping his temper. They will see a parochial primitive predisposed towards a reductive approach to conflict resolution, a sort of spaghetti western hero who will invite adversaries out the back where we can settle this with our bare fists, man to man. And they will be antagonised, if not downright angry. Who knows, one of them might offer to take him out the back and sort out his attitude for him. « Abbott’s kiss of death to G20 Brisbane.